This is my re-creation of a dish I recently enjoyed at the Yarra Glen Hotel. It was a great fresh side dish and I was keen to eat it again. However I'm trying something at little different today in terms of how I present the recipe. I don't know about you, but sometimes I like to read recipes straight up, give me one or two great photos and then I'm keen to scan straight to the ingredient list and instructions. Other times I like to linger over the story and the process photos and get a visual feel for the recipe. Today I'm trying to cater to both moods. The embedded photo story below is a visual telling of the recipe. I'm going to try to use this when the recipe I'm making is pretty or I can tell a story with it or probably more correctly when I have the time and inclination to take a stack of photos as I make a recipe! I'll also use it when I want to share more photos of something that may not interest a lot of people such as photos of the boys or our holidays but I still want to post them anyway. And if lots of photos are not your go, you still have the option of a couple of photos and skipping straight to the business end! Either way, I hope you enjoy this fresh and zesty salad. 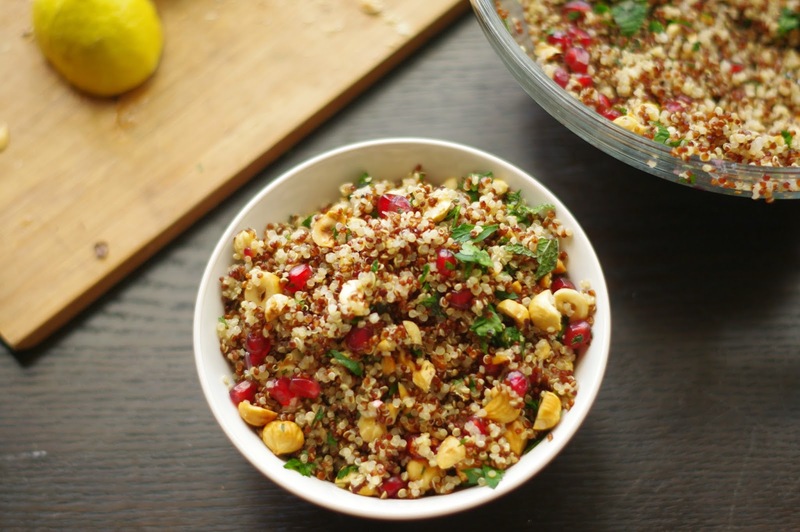 Add 2 cups of water to 1 cup of quinoa in saucepan. Bring to the boil, cover and reduce to a simmer and cook for a further 12-15 minutes. Let sit with lid on for further 5 minutes. Meanwhile roast hazelnuts in 200 degree oven for 8-9 minutes. Remove from oven when dark brown and skins rub off easily. Allow nuts to cool slightly before rubbing with clean tea towel to remove skins. Cut pomegranate into quarters and pop arils into bowl, retain juice if possible. Roughly tear herbs. 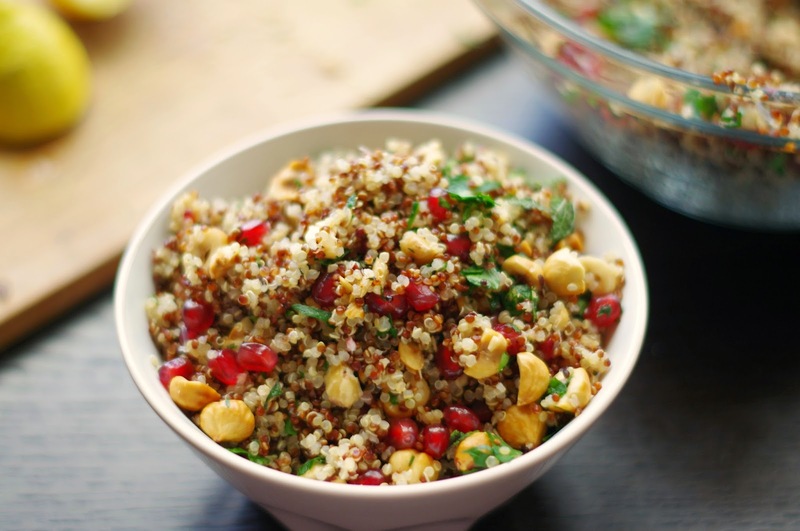 Combine quinoa, hazelnuts, pomegranate arils and herbs in serving bowl. To make dressing combine oil, lemon juice, salt and pepper in a small jar and shake to combine. Drizzle over salad to serve. Tell me, do you like to linger over recipes or skip straight to the business end? Danielle this salad looks delicious! Love that it has so much colour, texture and flavour. I love your photos Danielle, they are stunning and really tell such a great story. Oh yum! I love fresh salads, especially in summer at work. This looks fantastic!